"Better to shop in Hell, than serve in Heav'n." I’m not sure you will catch sight of Satan wandering the aisles of Tesco, however, pushing a shopping trolley, forked tail draped loosely over one arm, while he picks out bottles of Christmas sherry from the shelves, two for the price of one. You will, however, find Mammon there. 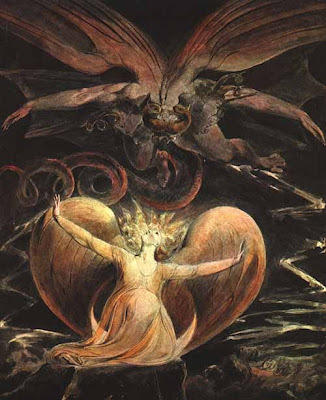 Jacques Auguste Simon Collin de Plancy in his Dictionnaire Infernal (1818) describes Mammon as “Hell’s Ambassador to England.” And you might add that Christmas is his time of year. There’s nothing more irritating than to have some jolly pop-tune tinkling through your head when you’re feeling anything but jolly yourself. That’s the trouble with Christmas: relentless jollity. Right now the tune is “It’s the Most Wonderful Time of the Year,” as featured in the Marks and Sparks advert on the telly, with Twiggy and a bunch of younger models gallivanting about in a pastiche of some 1950s Hollywood romantic comedy. No it’s not. It’s the Most Annoying Time of the Year. It’s particularly annoying when you have the same tune being played over and over again to remind you that you STILL haven’t got round to buying your presents yet. I’ve been scouring the papers for bargains. Here’s one. Why not try a box of Opulence chocolates from Harrods? At £100 for 80 chocolates it would make an ideal present for that favourite aunt to enjoy after her lunch on Christmas day. £100 for 80 chocolates works out at £1.25 a chocolate, so maybe it would be advisable to restrain the aunt from actually eating the chocolates. Maybe she could be encouraged to just take the occasional lick instead. This also has the advantage that it can be turned into a parlour game for the rest of the family. Simply gather around and estimate the value of each lick. 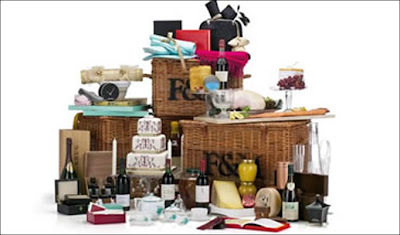 This is cheap compared to a Tercenturian Hamper from Fortnum and Mason (pictured). A snip at £20,000. I suspect the only reason for buying this is to show off how rich you are. Or how about a dinner suit from Matalan, costing £40? This is a case of the sublime to the ridiculous, of course. For the price of one box of chocolates from Harrods you can get two dinner suits from Matalan, plus a spare trouser leg and zipper. Pardon? So they make dinner suits in co-ordinating colours to match your table cloth and napkins now? How modern. She thought we’d been talking about a £40 dinner service. My whole family are great fans of Matalan whose original shop was situated in Tamworth in the Midlands, not more than forty miles from where we were brought up. It’s where they are today, the whole lot of them, in the brand new Matalan store in the East Kent Retail Park near Broadstairs where they are doing all of their Christmas shopping for the next twenty years I suspect. I do hope they buy me a dinner suit. I want a red one to go with my Father Christmas bow-tie and matching earmuffs. I intend to look sophisticated at the dinner table this year. is a columnist and author with four books to his credit: Fierce Dancing (Faber & Faber 1996), Last of the Hippies (Faber & Faber 1999), Housing Benefit Hill (AK Press 2001) and The Trials of Arthur (with Arthur Pendragon, Element Books 2003). Columns have included Housing Benefit Hill and CJ Stone’s Britain in the Guardian Weekend, On The Edge in the Big Issue, On Another Planet in the Whitstable Times and Written In Stone in Prediction magazine. 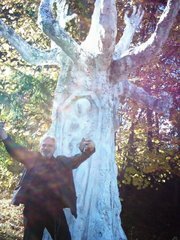 He is currently working on two new columns, and his latest book, the “biography” of a well-known supernatural being. He lives in Whitstable in the UK and, when not at his desk, is a part-time postman, which he describes as “like a four-hour workout every morning”. He is almost exactly 20,000 days old. See above for link to the website.